In Kent we saw a man with a tractor and a table next to the road. 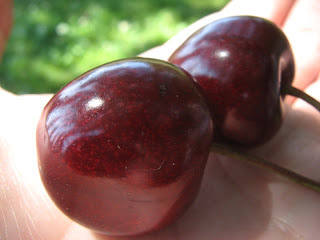 It being Kent, and it being cherry season, we stopped. (It also allowed us to gracefully turn around and continue the search for the missed turn-off.) Upon enquiry, the man explained that he was not the farmer, but he was employed by him. 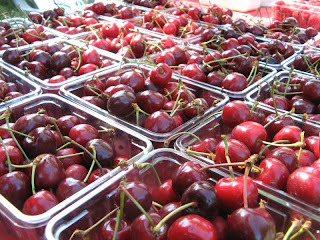 And, most importantly to our minds, these were in fact their cherries. They were fat and shiny, unblemished by rough handling or miles of shipping or winters of cold storage. And their flavour exuberantly confirmed it. They supplemented our lunch of packed sandwiches. In the shade of an oak tree. On clover. Just outside Sissinghurst Castle Garden. Not bad. A cool, fruity cocktail would have made it even better. Maybe with a cherry at the bottom of the glass. Lovely. Kind of Paradise Lost-ish...Actually I meant Brideshead Revisited. They have a picnic with red wine and fresh strawberries under a tree, on grass, not clover. Yours sounds wonderful.